Born in Minori on the Amalfi Coast, Gennaro’s quintessentially Italian spirit and positive nature has made him a TV favourite. He regularly appears on Saturday Kitchen and other shows and more recently his own TV series, Two Greedy Italians on BBC2 with accompanying books. 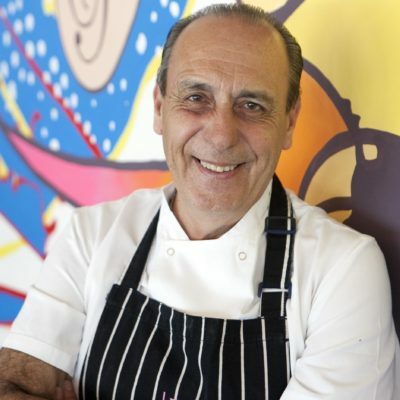 Gennaro has worked in some of London’s most popular restaurants, such as Antonio Carluccio’s ‘Neal Street Restaurant’. In 1999 he opened his own restaurant ‘passione’ in Charlotte Street, London, which was awarded Best Italian restaurant in 2005. Gennaro is currently involved in the Jamie Oliver restaurant chain, Jamie’s Italian, where he creates the dishes and trains the chefs nationwide and abroad. His first cookbook, Passione, published by Headline in 2003 won Best Italian Cook Book 2003’, at the World Gourmand Cookbook Awards and was short listed for the André Simon Award. Also published by Headline are Gennaro’s Italian Year, Gennaro’s Home Cooking and Gennaro’s Easy Italian. Gennaro’s cookbooks include Let’s Cook Italian, Slow Cook Italian and Gennaro’s Italian Bakery – all published by Pavilion Books. His latest collection of recipes, the fully updated Gennaro’s Passione: The Classic Italian Cookery Book published July 2017. Since 2013, Gennaro has had his own you tube food channel and in 2015 his Food Tube Pasta book came out. Gennaro is ambassador of Citalia, the longstanding Italian holiday specialists as well as the face behind the Bertolli with Butter spread.